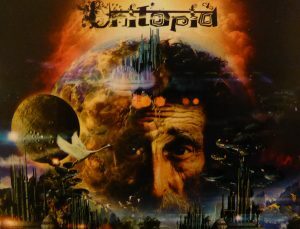 Unitopia seems to have been a band who have managed to elude me. Another fine example of Australian musical talent Unitopia are essentially the writing partnership of Mark Trueak (lead and backing vocals) and Sean Timms (keyboards, programming, mandolin, banjo & BV’s). Joined here for the best part by regular cohorts contributing guitars, Bass, drums, soprano saxophone, backing vocals, trumpet as well as the Adelaide Art Orchestra all adding a great feel to this three disc digipak complete with a 24 page booklet with individual track credits and synopsis by Sean Timms who along with band member Matt Williams remastered the bands first album More Than A Dream included here in it’s entirety which along with two bonus songs Unitopia and There’s A Place make up the first disc in the set. Packaging and presentation is first class as is the norm with Ed Unitsky’s stunning artwork. All told there is over seventy minutes of music to hear including reworkings, remixes and even previously unreleased songs. I found myself working at a disadvantage reviewing the remastered debut album (More Than A Dream) as i hadn’t heard the original so my findings are based upon what i heard emanating from my speakers and headphones. The dramatic Mellotron opening on Common Goal complete with spooky electronic jiggery pokery lead on to some brassy sounding synth which on first hearing sounds a little cliched. Initially i found this song unappealing until i realized that it was buzzing around my head all day. Drums are solid and the overall sound is tight with a lot going on across the soundstage. The brass section add scale and fullness making for a great opener which morphs seamlessly into Fate via some great tenor sax offered up by Mike Stewart. There’s more of a pop slant appearing throughout this song with some great backing vocals by Neusa Georgiou, Ian Polly Politis and Mark Trueak along with grungy guitar licks courtesy of Matt Weaver and Pat Shirripa. This high energy, bright and breezy song gets the feet tapping. In contrast at first Justify brings down the pace a little and was another track i was unsure about on the first run through. Bleak guitar chords and dirty Hammond are given further darkness by some mean bass lines laid down by Con Delo. This song is a stark warning about global warming and how we justify what we do to it’s contribution. Considering the song was written in 2002 it gives the listener a picture of just how far down the line we are with such an emotive topic. Sean Timms puts out a fab Rhodes solo at about 4 minutes 10 seconds in backed with Mellotron and a Chris Squire-like bass accompaniment turning it into a bit of a rocker. Pat Shirripa’s acoustic and electric guitar here are blinding whilst Mark Trueak’s voice takes on a Peter Gabriel style towards the conclusion backed by cello and Mark’s then ii years old daughter Holly providing a haunting vocal adding a sweet moment to the melee. The dramatic intro to Take Good Care by the Adelaide Art Orchestra reminded me very much of the Star Wars soundtracks adding scale to the proceedings. The original 1997 demo of this piece can be found on disc two though ultimately i found myself returning to this version. Another song about the environment this time more about the effects of war. Some nice ethnic vibes going on here though give to me the feeling of big production like The Lion King. Hey, no bad thing! Prog for the London Palladium methinks. Back in a more rock tempo is Ride. A drum machine pattern set up by Sean Timms though reassuringly reinforced by Brad Polain’s powerful use of the real thing give a Phil Collins pastiche to this song. An enjoyable piece setting up nicely the delicate intro to the title song More Than A Dream. This song for me has a great feel good factor so badly needed amidst the gloom of today. The Adelaide Art Orchestra lend an Alan Parsons touch allowing Sean Timms keys to shine. Some nice Mini Moog growls within always a winner for the aging Progger. A most worthy title song if ever i heard one. The song that really had an effect on me throughout the whole album was Slow Down. Well written, thought provoking and beautifully sung i was enchanted. A huge message sent out here and one that should be adhered to. I was less keen by one of the main samples used as i think it dated the song, though once again the Adelaide Art Orchestra made this piece a little special. It definitely struck a chord with me. Remaining upbeat the band still in semi protest mode embark on a tale of frustration which once more i found myself nodding in agreement about, the speed of modern life. Aided and abetted by a team of backing singers Unitopia yet again embark on a peppy memorable melody that adheres firmly to the brain which you later find yourself humming. Yet another song that managed to get under my skin was Still Here. The double bass and soprano saxophone lines imprinting themselves on my psyche. Sean Timms banjo playing was so sequential it had me in Tangerine Dream mode. Time changes and percussion i found enjoyable too. Quality stuff. This would have been the concluding song of the original album though two extra tracks have been included on this disc. The first being a song Unitopia considered by Sean Timms to be “too trite and didn’t fit in with the rest of the album”. I would have to disagree. I found myself hit with an uplifting bouncy number which i thought fit perfectly. Unitopia benefiting from the vibrancy added by the brass section. Sadly i was less enthusiastic about There’s A Place, a duet with Mark Trueak and Neusa Georgiou which was a little too much like Peter Gabriel and Kate Bush for comfort. Moving on to disc two brought about a mixed bag. The first three songs are Matt William’s alternative versions of Common Goal, Fate and Justify. From being harder edged and rockier to pared down stark presentations. All down to personal preference. Also on this disc is the original twenty years old demo of Take Good Care which i felt benefited from the recent refit, two alternative versions by Sean Timms of Ride one of them an extended mix which to be honest i couldn’t see the point of. There is also dance mixes of More Than A Dream and Still Her which i felt was sacrilege though Sean’s remixes of Slow Down and Lives Go Round were pretty good. Matt’s alternative version of Still Here also worthy of attention. A more worthy inclusion than disc two in my opinion is disc three (dance mixes of Ride, There’s A Place, Common Goal and Fate aside) due to the inclusion of some great tracks like The Outsider from the bands Stories of HP Lovecraft. A little bit of King Crimson going on there at the beginning and none the worse for it. Mark Trueark’s voice sounding more like Nat King Cole than that of an Australian Prog band whilst Matt William’s guitar playing took me totally by surprise. There are a few Gilmour licks going on in places. I would have preferred to hear proper larynx and lungs singing backing vocals instead of a detectable software option though this did not detract me from enjoying a great and in parts raunchy piece. The Decameron too with it’s Gentle Giant quirkiness enjoys the enrichment of old school Prog which i warmed to quickly. 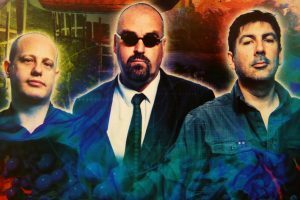 The Haunted Storm is a previously unreleased song finding Trueark and Timms collaborating with Stephen Layton on keys and guitar. I particularly enjoyed the tonality of this piece and the original keyboard sounds giving it authenticity. This one may even get passed the anti Neo Prog dissenters. Two unreleased demo from the late nineties by a collaboration between Mark Trueark an Sydney based muso Mathew Coxhead also reside on this disc This Life and Time For Change both of which sound like latter-day Genesis type songs. Indeed Trueark seems to be all out Phil Collins betraying his one time involvement with a tribute band. The finale to this rather excellent boxed set is The Dream Complete, a worthy edition to all of the original pieces here within and sadly the bands swan song. don’t take from that a dower farewell as the band walk slump shouldered into the setting sun. Instead it is a celebration of their achievements to date with a positive look to the future. Striking guitars by Matt Williams and Pat Shirripa dual with Timms blazing Moog solo to bring to an end a fabulous journey. For those like myself who missed the train with Unitopia The Dream Complete is a must have. Listening to it has made me want to explore the bands albums i feel i have missed out on. To fans and followers it’s a worthy addition to their collection and own something special to boot. Production, packaging and shear musicality, this three disc box set has it. 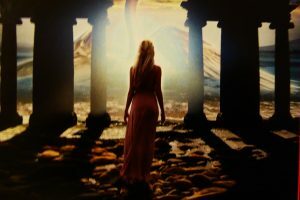 The Dream Complete May be Unitopia’s swan song but it is one hell of a note to end on. www.gep.co.uk Price £16 plus P+P.